UNV participated in the United Nations Climate Conference (COP23) on 6-17 November 2017 in Bonn, Germany, to highlight the role of volunteers in transformative climate action and community resilience. In addition to mobilising over 600 volunteers to support the event, UNV brought the voices of volunteers into the dialogue. UNV Booth: 6-17 November. Location: F 26 01, UN Systems Exhibition Area, Bonn Zone. Throughout COP 23, UNV, The United Nations Entity for Gender Equality and the Empowerment of Women (UN Women) and the International Labour Organization (ILO) are sharing a booth that showcases the work they are doing to advance SDG 5 on gender equality. The booth features a gender game, a rolling audio-visual show, videos and other informational materials. High-Level Event - Intergenerational Inquiry: 9 November at 1:15-2:45 PM. Location: Meeting Room 2, Bonn Zone. Organized jointly by UN Climate Change and YOUNGO, its official youth constituency, the Intergenerational Inquiry aims to provide a platform for youth and decision-makers on how young people can enhance the implementation of the Paris Agreement and the Sustainable Development Goals. UN Youth Volunteer Victoria de Mello will be speaking at the event on the role of youth volunteers in climate action. Victoria is a human rights officer from Brazil, and currently serves as Business and Human Rights Officer for the United Nations Development Programme in Asia and the Pacific. 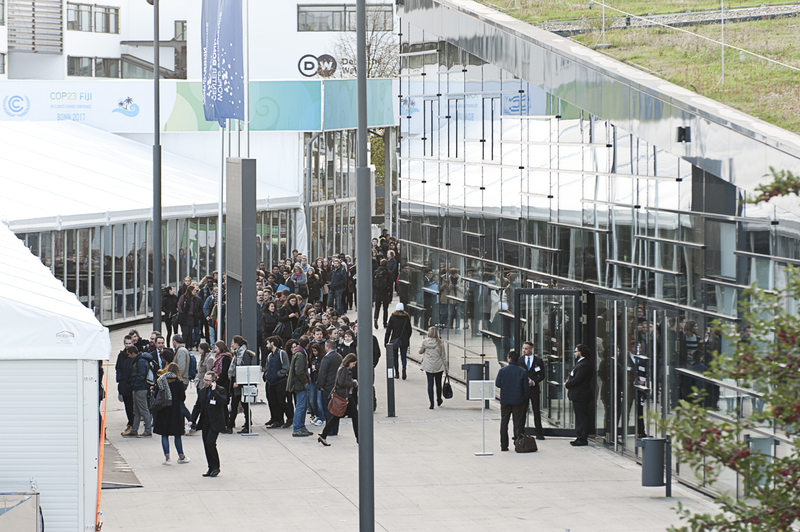 The event is a major highlight of UNV’s engagement at COP23 as it engages youth delegates from around the world with key players on the intergovernmental climate change arena. 15th Development & Climate Days: 11 November at 11:30AM. Location: Hotel Grand Kameha Bonn. This event is organized by the International Institute for Environment and Development (IIED). UNV’s Amanda Mukwashi, Chief, Volunteer Knowledge & Innovation Section, will facilitate a session on building resilience in fragile and conflict contexts, sharing some emerging findings from the research for the State of the World’s Volunteerism Report 2018. Organized by the Embassy of the Republic of Korea, Bonn Office, this COP23 Special Event will focus upon innovative energy transition in the transport sector, highlighting the link between land, renewable energy and climate change, and showcasing innovative ways for enabling energy access in the Global South. At 10:05AM, UNV’s Executive Coordinator, Olivier Adam, will present a keynote speech on volunteering partnership solutions towards a green future for all. An all-day event, the Forum will feature several panel discussions around low carbon options and innovative integrated systems. From 16:45 – 17:30, UNV will be moderating a special session “Enabling Energy Access in the Global South” which will also feature the Green Innovation Alliance – an innovative partnership that breaks new ground for volunteerism in the renewable energy sector. UNV and the Republic of Korea are partnering on this new initiative, through which UNV will connect stakeholders in the public, private and civil sectors, broker engagement and mobilize volunteers. Through corporate sponsoring, national, international and online UN Volunteers will be strategically placed to support renewable energy projects within UN organizations. The thread that binds: Is innovative volunteerism the solution to Africa’s developmental challenges?